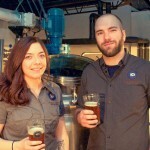 John Ritenour and Mariah Gavin brew a range of tasty beers at Spencer Devon Brewing. January 28, 2016 Post 0010. We’re using Thursday posts for a while to chronicle first rate beer destinations in our metaphorical back yard. There isn’t a section of the country that doesn’t sport breweries similar to the ones we celebrate here; we’ll hop farther afield as we’re able. Today, we visit Fredericksburg, Virginia, home to several breweries, a fine beer bar, and a scenic old town to savor. The breweries epitomize the new generation of start-ups, with a delightful range of experiences. January 25, 2016 #009 We’re old enough to remember when all but a handful of breweries in the world waged constant and unrelenting war against Brettanomyces, a yeast that can impart a sharp acidic accent to the beer it ferments. We’re amused, and often grateful, to have lived long enough to see the maligned yeast become a microbiological rock star. 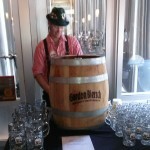 Brewmasters at both GB and RB host frequent events and tappings. January 21, 2016 Every real ale drinker in England has a “local”—a Cheers-like home away from home. The beer only has to be good enough – it’s the welcome and the sense of belonging that’s the big draw. Michael Jackson’s was the Ardmore Arms—certainly not the most elegant bar in London nor the one with the widest selection. But a dependable, well-kept pint of Fuller’s was good enough for the greatest beer hunter of all time, and, truthfully, we think the pint of DC Brau or Port City that is increasingly easy to find today is better than that. January 18, 2016. BrewDog’s new American brewery shouldn’t, we suppose, be a surprise. BrewDog has been one of several truly avant garde brewers for the last several years. But BrewDog has managed successfully to maintain an “in yer face” adventure in brewing with a remarkably successful empire of pub outlets. 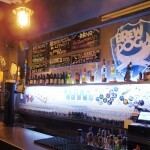 Our first – and still one of the best—BrewDog was their outlet on Argyll Street in Glasgow’s West End. Hopping Around Here: Many Hoppy Returns for Eastern Farmers—and a gem from Utica. January 14, 2016 Recent beer geeks associate hops with the Pacific Northwest. Old timers know that hops were once a big part of the economy of eastern states. While we’re deeply grateful for all that our West Coast friends have done to protect and develop our favorite plant, we’re delighted to see a resurgence in Eastern hopping as well. Some of the resulting beers manifest a flavor unlike any coming from the west coast or the South Pacific. Chris Elliott provides a wealth of useful information for travelers in his Washington Post column and other publications. Recently he included us in his article which you can read if you click here. His article talks about our time in Bologna- and you can read more about the beers there by clicking here. IPAs are the largest selling style within the craft beer segment. But not all IPAs are the same — some are barely recognizable within the style. We’re taking march to sample IPAs from Brut to brutal and dry to juicy. Dial in below for some insights into a style that’s grown far past its origin. 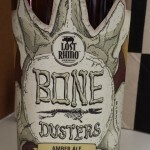 >>>>>Scroll down below this entry to find the featured beer of the day. The Story— This is another beer we found in the downstairs caverns of the Railroad House in Marietta. Pennsylvania. There is no way a bar this good should lie under a pretty routine B&B, but it’s a reason to go there, book there, drink there, and listen to the trains running just a few feet from the end of your bed. We loved the whole experience. We’re happy that Sacramento, an early craft beer city, has returned to the fold with some nationally distributed pleasures. IPAs aren’t all that hard to brew, but with 7000 breweries in the countries, mistakes are made. Track 7 does this well. Ellie liked it, I loved it. The Beer- A gold malt base with dried fruit and floral hops. Both grow and mingle with more yeast at the end. Dandelion, some Demerara sugars. Richness and hoppiness as it drinks. About these posts: We taste and evaluate over a thousand beers every year. The beers posted here rank in the top quarter of those tastings. Values: “fair” is a good beer at an above market price, “good” is worth the money, “very good” is a bargain, and “excellent” is a steal.Next week we’ll return to visiting fun places to explore beer — and much more–a different destination each week. Our beers of the day will feature beers from this wonderfully wet destinations. For this week, though, we’ll take a quality break and give a shout out to brewers from all over that made the winter a bit warmer. The upside is that some of these beers may be available in a good beer store near you. A caveat as always: the vast majorities of craft breweries may have a few beers that are usually available, but their most interesting beers are usual season or one-off brews that we may rave about, but you can’t find. Our specific beer descriptions, can tell you what sorts of beers the brewery does well; if you don’t find the exact beer on tap, you’ll probably find something similar.